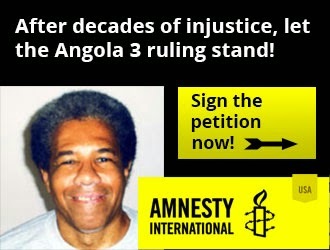 Please Take Action for Albert Woodfox! On Monday, June 8, 2015, US District Court Judge James Brady ruled that the Angola 3's Albert Woodfox be both immediately released and barred from a retrial. The next day, at the request of the Louisiana Attorney General, the US Fifth Circuit Court of Appeals issued a temporary stay of release set to expire on Friday, June 12. As the week intensified following Judge Brady's ruling, both Albert Woodfox and his family, friends & supporters wondered if he would finally be released over 43 years after first being placed in solitary confinement. Amnesty International USA launched a petition calling on Louisiana Governor Bobby Jindal to honor Judge Brady's ruling. On June 9, US Congressman Cedric Richmond (LA-02) issued a statement declaring that "Attorney General Caldwell must respect the ruling of Judge Brady and grant Mr. Woodfox his release immediately...This is an obviously personal vendetta and has been a waste of tax payer dollars for decades. The state is making major cuts in education and healthcare but he has spent millions of dollars on this frivolous endeavor and the price tag is increasing by the day." On June 11, eighteen members of the Louisiana House of Representatives voted unsuccessfully to pass a resolution (H.R. 208) urging Attorney General Caldwell to stop standing in the way of justice, withdraw his appeals, and let Judge Brady's unconditional writ and release ruling stand. However, on Friday, June 12, the Court responded by scheduling oral arguments for late August and extending the stay of release at least until the time that the Court issues its ruling later in the Fall. Among those who communicated with Albert during that emotional week was Southern University Law Professor Angela A. Allen-Bell. In the days following Judge Brady's ruling, she was a featured guest on several television and radio shows that focused on Albert's case, including National Public Radio. In this interview with Angola 3 News, Prof. Bell discusses her new law journal article and reflects upon the latest developments in Albert's fight for freedom. She argues that recent Angola 3-related media coverage in the US is becoming "more substantive," and that this month "the media got bolder and began digging deeper than just a soundbite." Literally hundreds of news websites around the world published articles about Judge Brady's ruling. The New York Times, who in an earlier editorial from 2014 declared Albert's four decades in solitary to be "barbaric beyond measure," chose a headline for their June 10 article that cited Albert's "Torturous Road to Freedom." The next day, the NY Times reprinted an Associated Press article entitled "What Has Louisiana Got on the Last of the Angola Three?" Answering the question posed by the headline, the articles states: "Woodfox's long-simmering story has been the subject of documentaries, Peabody Award winning journalism, United Nations human rights reviews and even a theatrical play. It's a staggering tale of inconsistencies, witness recants, rigged jury pools, out-of-control prison violence, racial prejudice and political intrigue." Media coverage in the state of Louisiana itself also seems to be improving. For example, writer Emily Lane of the NOLA Times-Picayune responded to Brady's ruling with a series of in-depth articles, focusing on the specifics of how and why Albert has been in solitary for over 40 years, as well as the physical and mental impact of such treatment. In another article, the Times-Picayune quoted extensively from a statement made by Teenie Rogers, the widow of slain prison guard Brent Miller. "I think it's time the state stop acting like there is any evidence that Albert Woodfox killed Brent," Rogers said. Meanwhile, Albert remains in solitary confinement, with Louisiana authorities "not letting up on" the "last of the 'Angola3.'" Our first interview with Prof. Bell, entitled Prolonged Solitary Confinement on Trial, followed the release of her 2012 article written for the Hastings Constitutional Law Quarterly, entitled "Perception Profiling & Prolonged Solitary Confinement Viewed Through the Lens of the Angola 3 Case: When Prison Officials Become Judges, Judges Become Visually Challenged and Justice Becomes Legally Blind." Our second interview, entitled Terrorism, COINTELPRO, and the Black Panther Party, examined her 2014 article, published by the Journal of Law and Social Deviance, entitled "Activism Unshackled & Justice Unchained: A Call to Make a Human Right Out of One of the Most Calamitous Human Wrongs to Have Taken Place on American Soil." This new interview, now our third, is timed with the release of of Prof. Bell's latest article, published by the University of Miami Race & Social Justice Law Review, entitled "A Prescription for Healing a National Wound: Two Doses of Executive Direct Action Equals a Portion of Justice and a Serving of Redress for America & the Black Panther Party."